In celebration of the 20th Anniversary of San Diego Dance Theater's iconic "Trolley Dances," we polled the public and are bringing back your favorites - original sites and dancers used whenever and wherever possible. 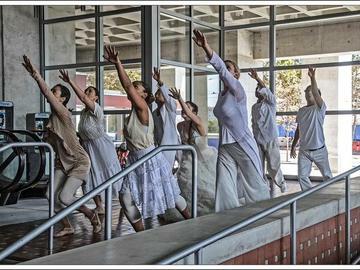 Choreography by San Diego Dance Theater Artistic Director and Trolley Dances founder Jean Isaacs, Monica Bill Barnes, Kim Epifano of Epiphany Dance Theater, Bradley Lundberg, Debi Toth-Ward, and Terry Wilson. Starting point is Hazard Center Station. This year's route follows the MTS Green and Orange Lines and is fully handicap accessible. For more information or group sales for 10 or more, call 619-225-1803 or email info@sandiegodancetheater.org.